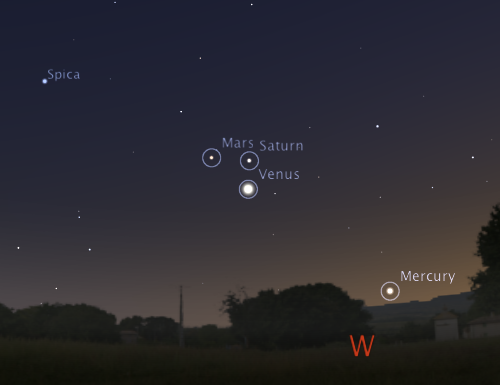 The early evening planetary show continues tonight. 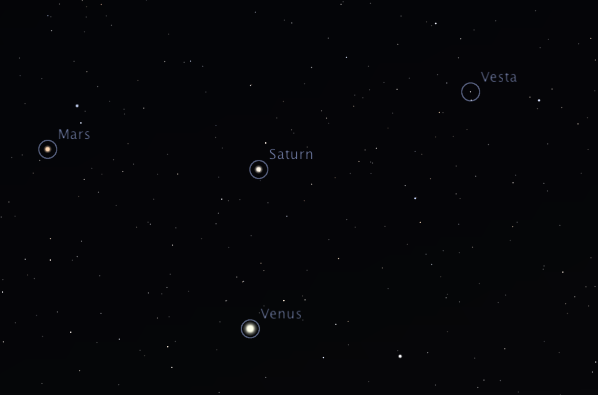 The celestial triangle of Venus, Mars and Saturn should be easy to spot with a good view of the western horizon. Mercury is also visible much closer to the horizon. Fred Quintao of Brazil pointed out that the large asteroid Vesta is also visible nearby. 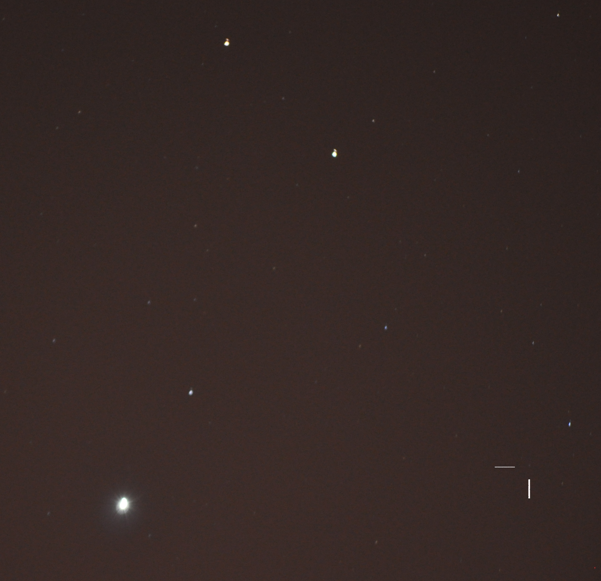 His image from August 2 shows Vesta to the north of the Venus-Mars-Saturn triangle. Image of the Vesta near the Venus-Mars-Saturn triangle. Image taken by Fred Quintao from Brazil on August 2, 2010. Credit: Fred Quintao. For a view of tonight’s alignment see the chart below. View of the western horizon after darkness falls on the evening of August 6, 2010. Created with Stellarium. For those wanting to find Vesta, the following chart is better. Vesta is too faint at magnitude +8.0 to be seen without the help of binoculars or a small telescope. Though not the biggest asteroid, Vesta is intrinsically the brightest due to a very high albedo (meaning it reflects a large fraction [42%] of the light that encounters it). Fainter chart showing the position of asteroid (4) Vesta on the evening of August 6. Created with Stellarium. Hi Carl, I got more photos today. Put links in one blog post (http://fredquintao.blogspot.com/2010/08/surprise-and-more-photos.html). I wrote it in English to make it easier for you. (I’m still trying to find Vesta in one of the photos I took today).